Steven Crowder is back and we're celebrating at Radio Café. Tony Weeks and the Tony Weeks Band featuring Tony Weeks will play a full set starting at 8p. We're also stoked to have the amazing Mando Saenz on the bill....he goes on at 7p. We're back at the original Basement....for the fans. Come enjoy the fun. It's been a while but we're doing it for the fans again...this time at amazing Radio Cafe on Gallatin. We are happy to share the night with friends Dutch Whisky and Brooks West. We go on second around 9p. Early (6p start) full band show at Two Old Hippies in the Gulch! So excited to grace the stage at one of the coolest spots in Nashville -- Two Old Hippies. We're playing from 6-7p so you can rock and still get a good night's sleep. They have amazing stuff too so come early/stay late to pick up some threads or maybe an amazing guitar. See you there. Join us for an early show at The Country Nashville (near Centennial Park) on a beautiful Sunday night. Perfect way to close out an amazing weekend. We play from 7-8p...other great acts follow. See you there. Excited to play the amazing Mercy Lounge stage as part of 8 off 8th. The price is right so come out and say hi. We're very happy to be back at The 5 Spot...where Tony Weeks and the Tony Weeks Band featuring Tony Weeks played its first show back in 2007. We'lre joining an amazing band from MO called Eric and the All In Band for this happy hour extravaganza. Come start your Saturday night off with us at The 5 Spot. Been looking forward to an acoustic show (like old times) for a while now. Why not do it at the best acoustic venue in town, Ugly Mugs, on a Saturday night! Doesn't get any better than this folks. Come get an espresso buzz and hang out with us for a while. More details soon. Business Casual at the Night Owl. Will be an amazing night. We're playing with our friend Dutch Whiskey and 5X Beaver. We go on around 9p. We'll be debuting a couple of new Business Casual tunes. Kelly Roach was a big part of the Nashvile music scene until his recently untimely passing. While we can't possibly include all the people Kelly's talent and enthusiasm influenced over the years, we're honoring him with a night of music he participated in at one of his favorite venues, The Basement. All proceeds go to things Kelly cared greatly about. Please come out and celebrate his extraordinary life with us all. We're happy to be back at THE EAST ROOM in fabulous East Nashville on such a fabulous day....Erik Estrada's Birthday!. We'll be playing a full band show, and some of our greatest friends, like The One and Only Bill Davis, will be playing the greatest music with us on this, the greatest night of all time. Come out and see us. We've missed you. BUSINESS CASUAL is back @ The Basement East! We are excited to be part of an amazing night of music at The Basement East with our friends Tom Pappas, Timid Death, and Hurts to Laugh and others. We go on around 10:30p. For the second time, we are the live entertainment on the famous Music City Roots Bus hosted by our friend The One and Only Bill Davis. We take this very seriously. It picks up at The 5 Spot on the East Side and at Soulshine Pizza on the West Side. The ride is free with your Music City Roots ticket. But the real show is on the bus. Amen. 50 minute full band set to celebrate the opening of the Ryman's new renovations. Very excited to be back at The Basement. 3 of the 5 band members have birthdays within a week of this show...so we're going to celebrate a the East Room. We're picking some of our favorite local bands to join us on the bill. Come celebrate with us! Playing with our friends Jeff Blaney & Dutch Whiskey as part of Palaver Records Night at one of our favorite spots -- FOOBAR. Don't miss it. We do it for the fans. 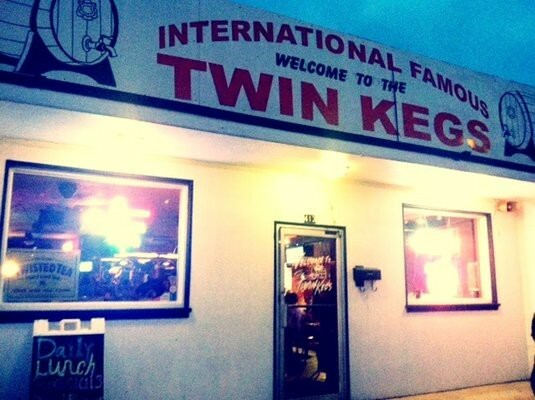 Twin Kegs on a Thursday with our good friends Lawless...what could be better? We're back at one of our favorite venues in the land. Don't miss it. We want to co-write with the fans! This show is your chance to become a published lyricist. Contribute some lyrics via the fan lyric board at the show, and we’ll record a song using all your lyrics (political and religious lyrics not accepted). We do everything for the fans....even co-write!! will be a lot of fun. 7p start time for Thumbs Up! --- Business Casual follows at 8p. Free. Side project night at The End...Business Casual and Thumbs Up! plus a few other friends. Really excited about this one. Come out and celebrate with us.